Funding from Sport England has helped more than 600 students from Chesterfield College to get fit and stay active as part of the national ‘Tackling Inactivity in Colleges’ project. The project, launched in the autumn of 2017, allowed the college to help students who do less than 30 minutes of physical activity a week to get fit and stay active. Since the launch of the project, the Healthy Lifestyle Team has helped to improve students’ physical and mental wellbeing. The activities are also designed to develop other key personal skills. An exciting programme of activities is on offer every week, designed to appeal to students who might not get involved with the traditional sports available in college. “Before I took part in this project I wasn’t into sport at all, I literally had zero interest in it. I would just sit in my room and play video games all day. I’m really enjoying it; it’s has helped me to become more active and I feel healthier too. As a foundation studies student, my time at college is all about developing the skills I need for the future and by taking part in this project, I’m learning more new skills like working as part of a team. 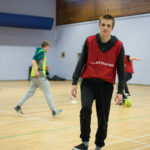 The tutors have been really encouraging and have helped me to get involved with lots of different sports including football, handball and tennis. So far football has definitely been my favourite. I’ve made lots of new friends as part of this project having met people I would otherwise never have had the opportunity to meet. We always have a good laugh and I’ve met up with some of them outside of the project’s activities too. Find out more about the range of courses and apprenticeships available at Chesterfield College.